An artist’s rendition of the future Mesa Verde National Park license plate includes Colorado’s distinctive mountains with snow and a cliff dwelling with a kiva ladder. Julie and Paul Booth’s backyard shed positively shines at night when lights are reflected on the license plates because the plates are painted with reflective paint. Instead of fake news, how about real news? Instead of political posturing and name calling, how about a project to unite us as a region and a state? How about a Mesa Verde National Park license plate? We learned a hard economics lesson this summer when the Durango & Silverton Narrow Gauge Railroad quit running because of the 416 Fire. Stores, restaurants and motels suffered. We are a tourist town, no doubt about it, so why shouldn’t Durangoans, and the rest of the state for that matter, support a Mesa Verde license plate? I think we will. We’re almost there. We need about 600 more signatures on a petition to get the Colorado Legislature to approve a brand new license plate to promote the world’s first cultural park set aside by my hero, President Theodore Roosevelt, in 1906. A successful tourist season at Mesa Verde means 600,000 visitors with a regional economic impact of close to $70 million. That’s why the Mesa Verde Foundation is acting to get approval for a shiny new Mesa Verde license plate. Proceeds from the sale of this special Colorado license plate will directly benefit the park. Rocky Mountain National Park has a similar benefit license plate as do the state’s colleges and universities. We have license plates for adopting shelter pets, for breast cancer and for hunting and fishing conservation. We have license plates for our franchised sports teams, for wildlife, for rivers and for state parks. Why not have a license plate for Colorado’s oldest national park? What a great idea! HHHI like license plates. In 43 years of marriage, we have most of the license plates my wife and I have ever purchased – or at least the colorful ones. Using baling wire to attach them to our backyard fence, we have a potpourri of plates. My wife, Stephanie Moran, came west from New Jersey, and we have her vintage Jersey license plate, which is now faded yellow and black with the motto “The Garden State.” We met in San Francisco. When she drove to Colorado to be with me to see if our relationship would “work out,” she came over Donner Pass in a 1968 Volkswagen bug, which we christened “Grumpy” because of its mechanical attitude. Sometimes it ran. Sometimes it didn’t. The car is long gone, but we still have the California license plate. We have a Garfield County license plate from 1976 when I started teaching fourth grade in Silt, when it still had dirt streets and wooden water lines. We have a bland, fading Ohio license plate from our years of graduate school and the birth of our first child. On the fence are two New Mexico license plates from our time in Silver City, when I directed a university museum and our second son was born. My academic career took me to Middle Tennessee State University, so on the backyard fence, we have a decade of Tennessee license plates. The plates include a state park plate with wild purple irises, the standard Tennessee plate that has a design like a soccer ball in the middle, and my vanity plate, 63 BIRD, for the 1963 Thunderbird I owned and proudly drove with the mammoth 350 horsepower engine, the tilt-away steering wheel and the taillights modeled on the afterburners of F-1 jets. Sold the car. Kept the plate. And like so many other Colorado exiles, when life and careers force us away from the state we love and we finally get to come back home, we have a few of the traditional Colorado license plates with snow-clad mountains sprawled across the top. Back in Colorado, within two days of coming home, we ditched the out-of-state license plates on our vehicles to purchase the green and white ones so we could become “locals” once again. HHHLicense plates. We pay for them. We put them on our cars and trucks. Then after a while the plates wind up on fences, barns, sheds and all variety of objects d’art. They sell in antique stores. They become collectible. 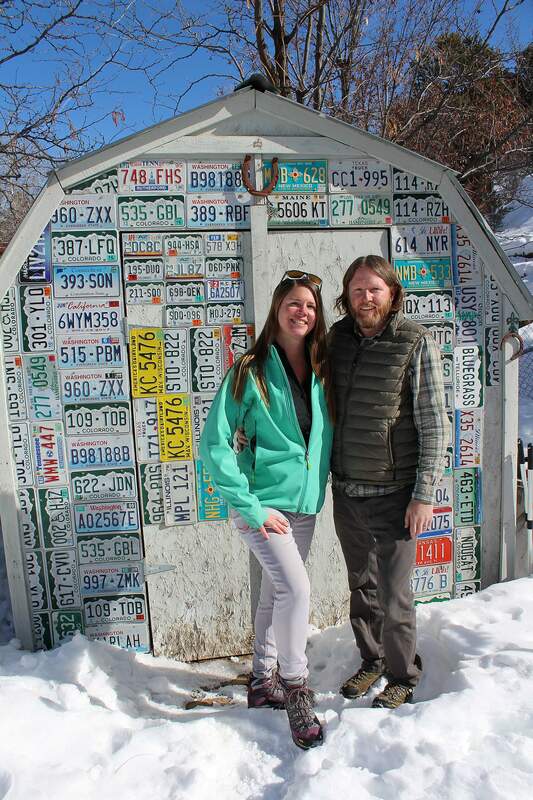 Julie and Paul Booth have adorned their backyard shed with license plates from 15 states. Friends continue to donate more plates. 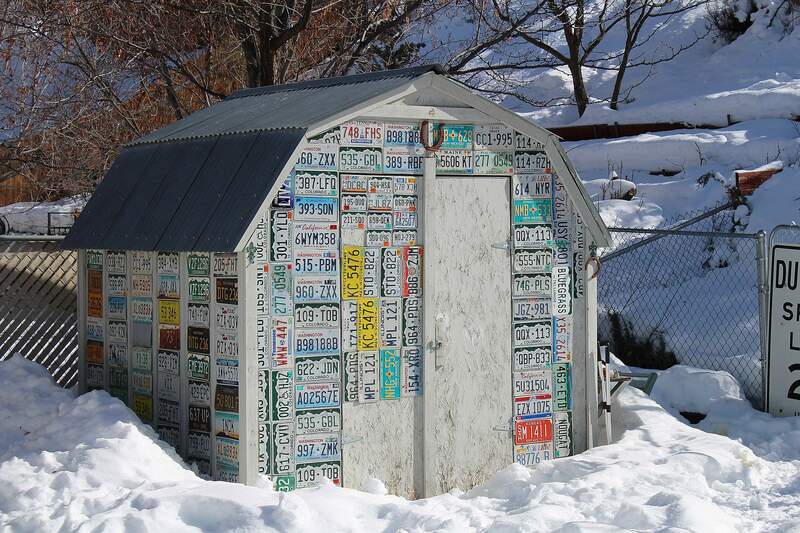 In Durango at 1008 Oak Drive, Paul and Julie Booth nailed license plates all over their shed. “The shed’s old and the wood’s not good. So it’s a protective thing, but it looks cool. At night it lights up when you shine a light on it because of the reflective paint,” Paul says. So far, their shed boasts license plates from 15 states. “It’s a great idea. I like the aesthetic. It gives the shed personality,” Julie says. “When friends come over, it’s a conversation piece,” Paul says. 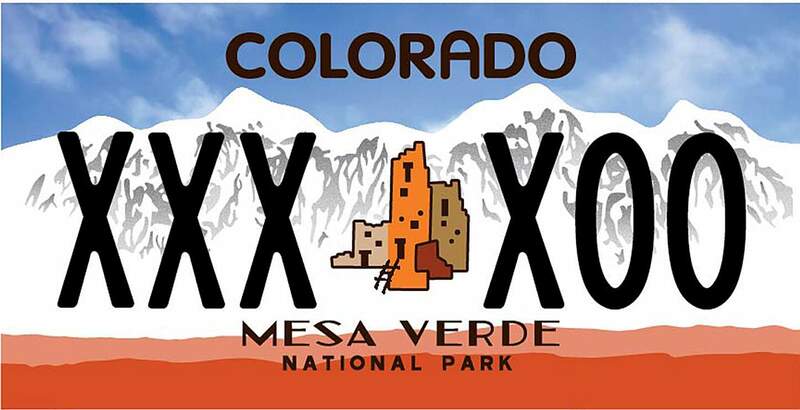 So how exciting will it be to have Mesa Verde license plates? Native Americans agree. 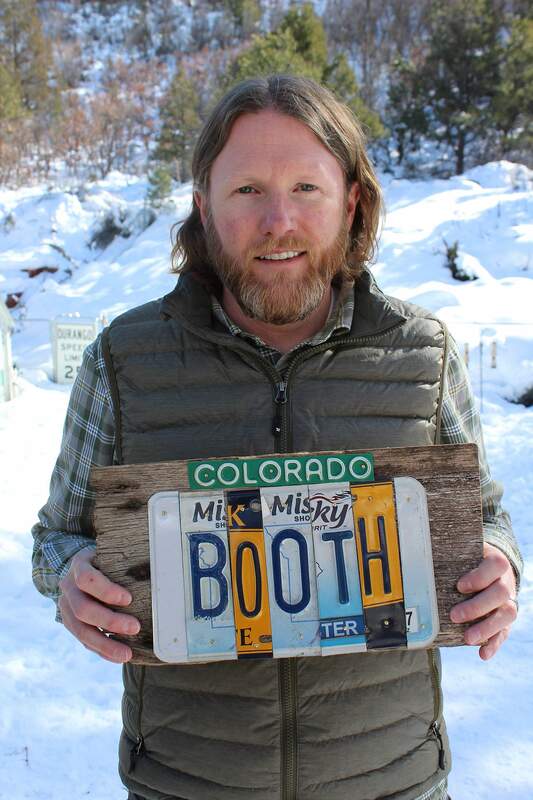 Now that Fort Lewis College art and design professor Paul Booth collects license plates, his mother knows just what to get him for Christmas – license plate art and gifts. To learn more, contact Burlile at janet@mesaverdefoundation.org or (303) 321-3120. Mesa Verde license plate bill sponsors include state Rep. Chris Hansen, Democrat, House District 6, and state Sen. Don Coram, Republican, District 6, representing Archuleta, Dolores, La Plata, Montezuma, Montrose, Ouray, San Juan and San Miguel counties. The draft design is a beautiful license plate showing off our Colorado mountains and the unique ancestral Puebloan architecture of cliff dwellings. I’ve signed the petition. My Fort Lewis College students have enthusiastically signed the petition. This is a project we can all support. I can’t wait to get my Mesa Verde license plates and put them on my bumpers. It will be a long time before they hang on the back fence. Andrew Gulliford is a professor of history and environmental studies at Fort Lewis College and an award-winning author and editor. Reach him at andy@agulliford.com.